Hike training with the Canyon Cougars began on Monday, November 5th. It's not too late to join us! Training will continue Monday through Friday. No hikes will be done on holidays. Meet in the Visitor Center's South parking lot by the Randall Henderson Trail. Here are some additional notes for those of you new to hiking with our group of wonderful women. 1. 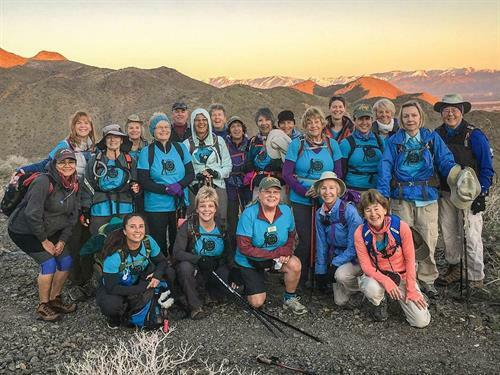 ALL skill levels are welcomed; we support all women who just want to hike for fun, make a new friend, and get in a little daily exercise as well. 2. You do NOT need to notify us if you are or are not hiking that day. Just wake up and decide. No pressure. 3. These hikes are short and easy to moderate ( usually 2-4 miles). Wear comfortable hiking clothes and shoes and bring water. Once you hike once or twice with us you'll know what additional gear you want to bring. You must be a current volunteer to participate: Click here to get started. Call 760-568-9918 for more information.